Fan Bingbing, in 1/260 of the outfits she has for this series, demonstrating that literacy really is the key to changing your social status. If you were rich and gorgeous, what else would you do other than pour 300 million RMB (other than investing in 75 more Dad? movies) onto a series with 260 costumes so you can cosplaying the last Empress reagent of China (the latest one being you, of course)? Fan Bingbing certainly did. 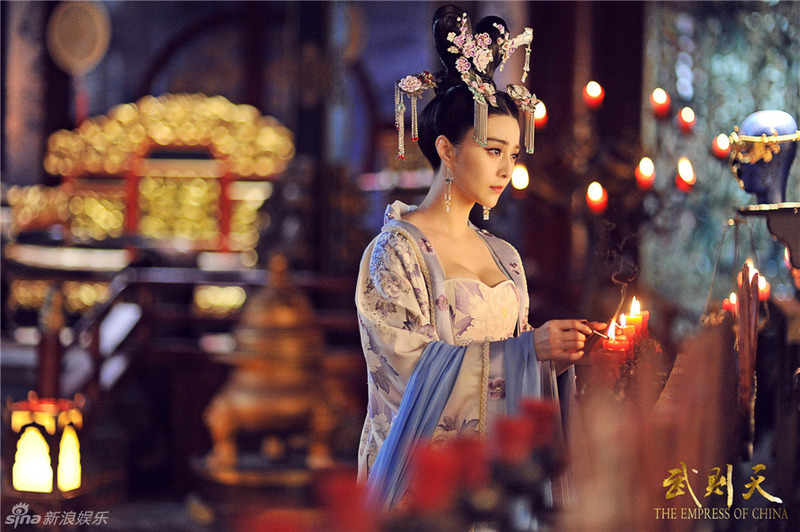 Although the spending for her upcoming series series, The Empress of China 武则天, might be a little over extravagant, I’m certainly not complaining given how pretty these stills are. More stills below, where she’s gorgeous even in peasant outfits! 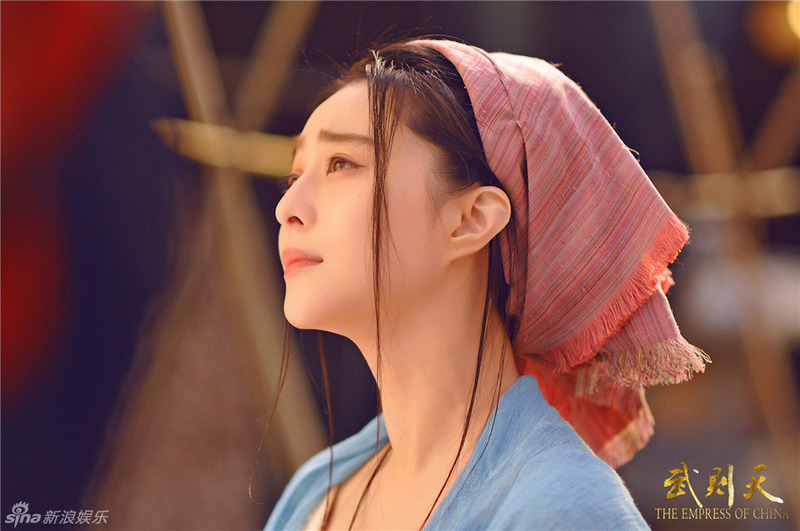 This entry was posted in Drama, Mainland China and tagged Fan Bingbing, The Empress of China by idarklight. Bookmark the permalink. Also I was wondering, are the costumes accurate? I mean I was quite surprised with all the skin showed by the cleavage. As we were discussing above, the Tang dynasty is famous to the general Chinese public for having the most revealing clothes from among all the other Chinese dynasties but cleavage-showing wasn’t exactly prevalent. It was present but based off of what we have, it probably wasn’t too common. Therefore, the costumes are probably more of the “in the correct direction but liberties are certainly being taken” kind of direction… especially with some of the hair and stuff… some of the styles that I’ve seen, not from these pictures but elsewhere, are very exaggerated. I assume they haven’t finished filming this drama? Nope, they just started filming a week before we posted the first post about it. WOW 260 COSTUMES!?!?! *W* I am looking forward to this drama already, haha! I didn’t actually even notice the cleavage until you guys mentioned it, so I wasn’t as distracted. Either way, I like the costumes a lot so far. I love the colors and patterns in the first dress, which imo is pretty authentic and much less jarring than to the “Korean-styled” color palettes used in recent historical dramas (most prominently in Lu Zhen and the upcoming Lanling series). That’s so true. We do need to thank the color schemes. That is true so they do have some wiggle room. I’m pretty sure I posted these links before, but I’m going to again, because they’re cute. Although this one is my faaavorite. Neither has Jimmy Lin, and his version of that book is even earlier! These people. The women in this WuZeTian version reveal too much cleavage. It’s as inelegant and unnatural looking as those overexposed heaving bosoms in Curse of the Golden Flower. Tang Dynasty ladies did wear low cut dresses, but surely not push-up bras. None of the ladies depicted in Tang Dynasty paintings, murals and sculptures were quite as bosomy and deeply cleavaged as those in the mentioned productions. Nor were actresses in past Tang Dynasty films. Zhang Yimou started the buxom trend in Curse of Golden Flower when he told the designer to follow the example of French court dresses. The results were eye-popping, distracting from the film, to say the least. It’s not as common as the film makes it out to be, but such styles definitely exist. I saw the peasant garb outfit and thought that since this IS Wu Zetian, is this supposed to be for the convent scenes? I think that’s the photo she looks best in, too, but the retouching was too obvious for my likings … My least favorite is the blue/white dress,mostly because her hair is a mess there. Wouldn’t she have her hair shaved off in the convent, though? btw, by blue/white dress did you mean the one with all the silver and violet danglies in her hair? That one was just O_O. Her hair looks like it’s shaped into a heart and all the silver embellishments were just too much. I think the shape was alright but there was too much going on and they were clashing. I think the Yin Tao version used a head wig (?) thing to make her look bald. I think that’s pretty common and easily done for dramas as long as it’s only for part of the show. Also, I feel like she’s been bald in a movie before. I have no idea if this is relevant, but I remember attending a lecture by a scholar on a Japanese nun who said that tonsure in those days didn’t necessarily involve being bald, but could just be cutting off a bit of hair (several inches?). Her costumes are so pretty, by the way.